Part of working as a professional DJ is having a portable, professional looking lighting show. However, chasing Christmas lights just wont do. The professional DJ needs an arsenal of many different types of lighting fixtures to truly create a unique package to present to your clients. These fixtures can be quite confusing at first, but with a little hands on experience you will be setting up your lighting like a pro in no time. Buy your lighting. DJ lighting consists largely of two types of lighting, stage lighting and intelligent lighting. Stage lighting is going to consist mostly of par cans. 4 par cans on each side on tree stands work just fine for a start up DJ business. Experiment with colored gel sheets to get the right mood setting colors for the theme or atmosphere of the party you are DJing for. Your other style of lighting is intelligent lighting. These are DMX controlled units which are capable of movement and color change and will add the special effects to your show. Buy the right accessories. Be sure that you are equipped with a DMX controller that can operate your style of lighting, the correct lighting cables for your lighting units, dimmer packs for to control the intensity of your lighting, and lighting stands and clamps to secure your lights in locations that will be most effective to your show. Buy a haze machine. There can be some confusion between a hazers, dry ice fog, and fog machines. Working from the bottom up a dry ice fog machine outputs a low lying fog that stays close to the floor. A fog machine puts out short bursts of heavy fog that stays around a medium height. A haze machine is your best bet for lighting as it emits a very thin haze of fog that spreads evenly throughout your entire space. 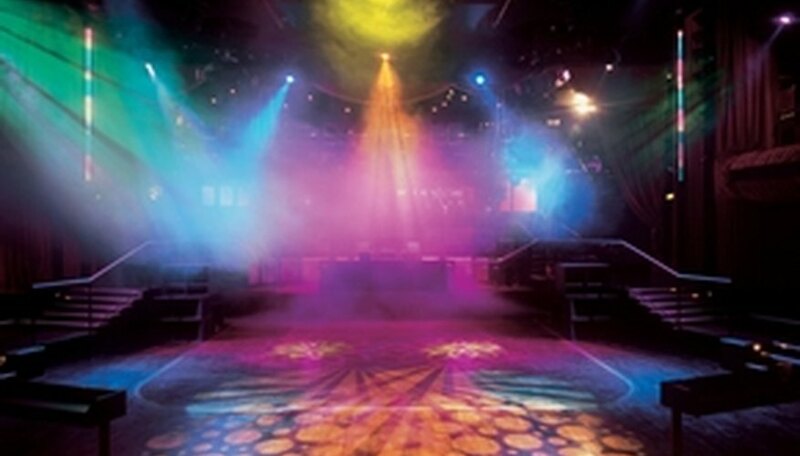 A haze machine helps refract and trace the lights and give an overall wow effect to your lighting show. Add accessory lighting. Moonflowers, strobes, disco balls, and lasers are all huge additions to your lighting arsenal that will add to the effect and professional look of your lighting show. Design your show. Only a real amateur just sets each unit to an automatic setting to bounce with the music. Plan where you are going to put your lighting, what color or gobos you are going to use, and then change them dependent on the mood of the song or the mood of the party. Invest in lighting control software. You can literally plan your whole lighting show before hand to choreograph with the music you plan to play. Lighting is expensive. Invest in quality bulbs and cords to assure that you will get good life out of your equipment. Be sure that your venue has the power to run your lighting show at least a few hours before you're on. This will prevent embarrassing power outages to your equipment.